Today, Australia is known throughout the world for its warm sunny climate, pristine beaches and coastal cities. But, in an episode that has become an integral piece of national folklore, between 1838 and 1902, swimming during the day was declared an illegal activity by New South Wales authorities, for fear that it raised ‘morality concerns’. While the ban has lent itself to fantastical headlines and humorous retellings, the reality of the ban is often exaggerated. Swimming, or ‘bathing’ as it was commonly referred to back then, was first forbidden in 1838, but only in select areas around Sydney Cove. Outlined in the Sydney Police Act, the ban applied only to those parts of the state that had been incorporated into municipalities, such as Manly council. Beachgoers wanting to take a dip were not completely barred from doing so – they just had to find a beach outside the ban. Usually, such beaches could be found only a stone’s throw away, but if swimmers drifted back towards an area where the ban applied, they could find themselves face-to-face with the council’s ‘Inspector of Nuisances’, a man whose duties also included catching runaway horses and pigs. In the early years of the 20th century, the ban gained more attention thanks to the actions of William Gocher, an aspiring politician and owner of the Manly and North Sydney News. In 1902, Gocher announced in his newspaper that he intended, bravely, to defy the ban and free Sydney’s residents from its unfair restrictions. He issued a challenge to the police and dared them to arrest him. Unfortunately for Gocher, however, the spectacle he had hoped for never came to be: when he stepped into the ocean the police paid him no attention and he received no response from the locals, who had already been ignoring the ban for some time. Determined to be caught, Gocher repeated his stunt soon afterwards to no avail, before approaching the authorities directly to dob himself in. Unsurprisingly, the authorities were unimpressed at being interrupted, for the public had long been ignoring the ban and the police had other more pressing matters to attend to. In fact, by the time Gocher walked into the ocean, the ban had already been overturned without his realising it. 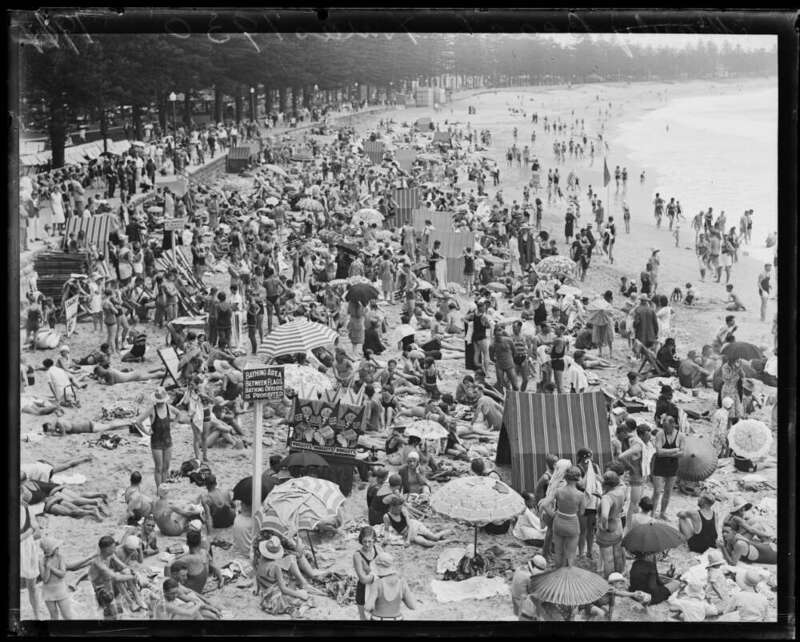 Image: Christmas Day on Manly Beach, 25 December 1930. Image courtesy of National Library of Australia/6301844.